It’s pretty clear that the President was re-elected, Obamacare is the law of the land. I think there are parts of the health care law that are going to be very difficult to implement and very expensive and at a time when we’re trying to find a way to create a path toward a balanced budget, everything has to be on the table….There are certainly maybe parts of it that we believe need to be changed — we may do that, no decisions at this point. 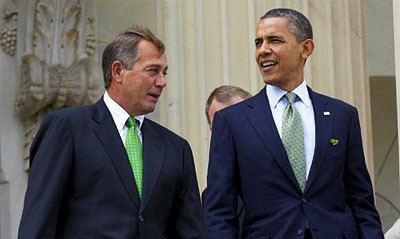 In that context, this latest could be another sop to the Tea Party — reassurance to the Tea Partyers who are soon going to be asked to accept some very uncomfortable compromises on the fiscal cliff that, don’t worry, really, seriously, the GOP leadership still has Obamacare in the crosshairs! But Dems see a serious side to this. One Dem I spoke to worried that the mere fact that Boehner still has to throw sops like this to the Tea Party wing means he feels more beholden to them than Dems had hoped — which wouldn’t bode well for the talks. I guess I’d take this as fairly ordinary jockeying for position during a difficult negotiation. Boehner knows he doesn’t have a lot of leverage, and threatening Obamacare—which Democrats care about a lot—is a good pressure point. It’s just one more bargaining chip he can use to limit the damage on the tax side of things. Keeping it on the front burner is probably just smart politics.